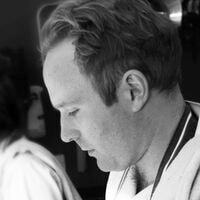 Thom Eagle is a chef, writer, and YBF-nominated pickler currently based at Darsham Nurseries Cafe. He blogs at In Search of Lost Thyme and is working on his first book. My most-used and -spattered book. Excellent on pastry, fish and vegetables as well as the obvious. Lovely prose, too. The first of her books I owned, as a leaving present from my first kitchen job. Her books contain worlds. I could have said any of her books; this is the first I had, and the one I've used the most. All of her food is perfect. Really makes sense of the mad clash of cultures that makes up Sicilian cuisine. Just beautiful, in every respect. Only just a recipe book, in any traditional sense, this makes me want to cook more than any other book on this list. The oldest surviving European cookery book is already telling us to simplify, to cut back on fancy sauces and focus on fresh, good quality ingredients. Opens up a totally unfamiliar (to me) cuisine. Her pickle recipes are absolutely outstanding. What's playing in Thom's kitchen?